“Parsons Hill” is a remarkable meet-up of two different clusters of electronic music when Simon Shreeve, the founder of Osiris Music, arrives on techno bastion Tresor. For years, Osiris has been an epitome of the dubstep and bass music and primarily known as home of Kryptic Minds, Shreeve’s main project so far. However, the UK label is getting hooked on techno, if to look at the recent output by Killawatt and Shreeve’s new alias Mønic. 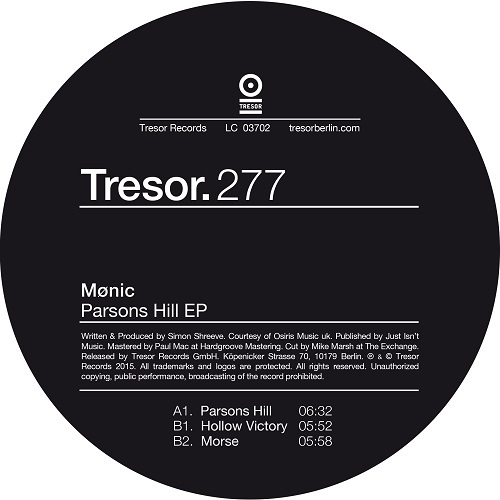 In the Mønic’s new EP, the title track is the closest to proper 1990s club tools and follows Tresor’s dress code with banging Beltram drums. Certain dissonance created by shifted rhythms and odd background hum propels the track above the usual 4/4 fare. The B-side is a drop-dead serious affair with rigid bass and spooky drones. Industrial-tinged crawlers, of which “Morse” is hotter, would do damage on a Funktion One system, but do not defeat similar productions.